Airmax Ecosystems has slashed filling times from manual filling of roughly one package per minute to filling and weighing as many as six units a minute. [Armada, MI] — A leading Midwest supplier of aeration technologies and natural treatments to maintain ponds and lakes has slashed filling times and labor requirements with an automated feeding system, transitioning from manual filling of roughly one package per minute to filling and weighing as many as six units a minute. The equipment allows the packaging operation to significantly reduce labor costs and expand capacity, improving its potential for growth. 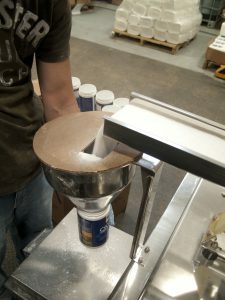 The company has been using the MARTIN® E-ZTM Auto-Scoop Filling System from Martin Vibration Systems Solutions for several months to package a variety of dry products, including natural pond treatments, fish foods and pond salts. “In the past, workers used to scoop these products from 40-60 pound bulk containers and fill retail-size containers on a scale,” Kroll explained. 15 seconds each. It’s almost faster than the operator can seal the bags and box them up,” he said. Kroll estimated that the company has packaged about 24,000 pounds of materials over the last three months. The E-Z Auto-Scoop Filling System incorporates a precision digital scale with programmable logic and a high-performance vibratory feed system that assures fast and consistent flow of material. The system was developed for small to medium-sized packagers, but has proven capable of 750 fills per hour (depending on the material and package size), an average of more than a dozen per minute. The E-Z Auto-Scoop Filling System incorporates a digital scale and high-performance vibratory feeder that assures fast and consistent flow. 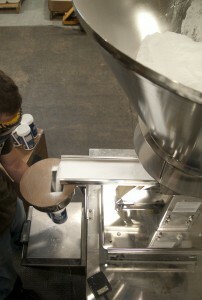 MVSS supplies both loss-in-weight feeders and volumetric feed/weigh systems. Customers find benefit in the company’s worldwide network of parts and service, and from the use of industry-standard components and non-proprietary software. Martin Vibration Systems Solutions is a leading innovator and supplier of feeders, weigh systems, and material handling products for a wide range of industries, including chemicals, food, pharmaceuticals, and foundries. The firm supplies electric, hydraulic, and pneumatic vibrators, vibratory feeders, hoppers, and other components. MVSS has built its reputation on developing the quietest and most energy-efficient designs available. They are engineered and built to deliver precise energy transmission, long service life, and low maintenance. For more information, call (800) 474-4538 or visit develop.shake-it.com.